This might come as a shock to some (it won't), but I'm not really a trainers kind of girl. I have a pair of Converse for running around in, but that's it. I live in flat shoes these days, thanks to a pesky foot injury, but trainers don't get a look in. If I can't wear high heels, I want the flats on my feet to be the prettiest they can be. I think someone at Aldo heard my pleas. Usually, sequins on shoes make me shudder. We are not at a 90s wedding. 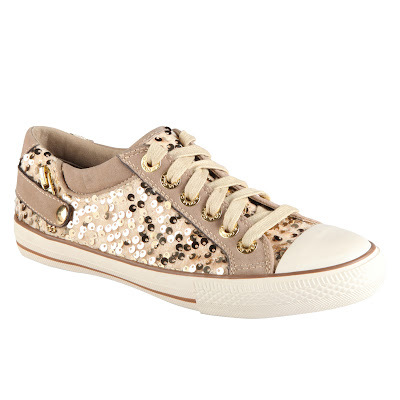 Then Aldo's designers came along with their sequin trainers and mixed them up with zips and surprisingly muted colours, and I'm excited. I really like these. It's not easy to avoid the whole jazz hands and tap shoes thing with sequins, but they've done exactly that. These won't look like you've nicked a pair of trainers from your niece. They're £50 and I think I'm going to have to fight Sara for them. I reckon the gold pair are a little prettier, but the dark grey of the second pair is winning me over. Which do you like best? Sian, I want BOTH pairs. They're a good "day" sequin. The grey ones are a little bit 'oooh, I wasn't going to go out but now I'm dancing all night in an Indie club'. That's my favourite type of shoe. You can't wear heels, and I can't wear flat shoes. Our feet are broken in opposite ways. I might need to try these on though. Gold for me, please. They remind me of my gold pf flyers which I've grown to love. Yes! super comfy and they jingle when you walk! !